Allergy to the dog hypoallergenic or anallergic? Allergy sufferers to dogs are intolerant to allergens found on the dog’s skin or allergens found in the dog’s splitle. Its are two different allergies conveyed through the hair of the dog. In practice, close and prolonged contact should be avoided. The level of intolerance is decisive in understanding whether living with a dog is sustainable. The symptoms and the level of reaction are completely subjective. The choice of having a dog must be assessed conscientiously by the direct concerned, preferably with the advice of a physician. We often hear about breeds of dogs that are not-allergenic or hypoallergenic as if the two terms were synonymous, but it is not so! Hypoallergenic dogs. The suffix hypo means a lesser amount of allergens. In the case of mild forms of allergy with moderate symptoms, coexistence with a pet is sustainable and the resulting benefits can justify some little inconvenience. The difference between a dog that does not give allergies and one that disperdes a lesser amount of allergens may seem subtle, it is instead decisive for those who suffer from allergies. For this reason the opinion of a doctor and to know well ours subjective reactions is fundamental for those who decide to make the choice of a furry friend. There are no allergy-free dog breeds. 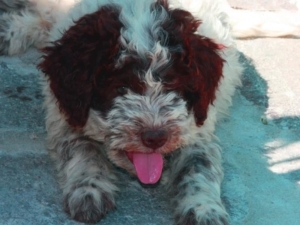 It happens with a certain frequency that ask us if really the Lagotto Romagnolo does not lose hairs and does not molt. That’s right! It is often a great convenience if we live in the apartment. Other times it is a necessity. The desire to have a dog is strong right in the allergic people or in their cohabitants. We try to reconcile the desire to have a dog with intolerance and the consequent symptoms due to a generally mild allergy. Our lagotto attend our house, our living room and the couch. They lay down on our carpets and live our car. 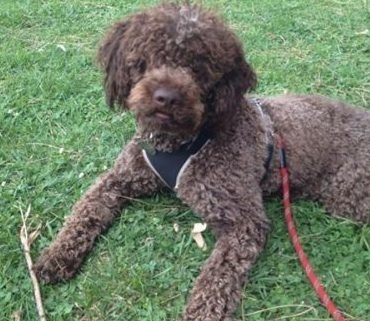 With certainty we can affirm the Lagotto Romagnolo is a dog does not lose hair. They are generally the curly-haired breeds that have this characteristic. They do not leave fur and have a lower flaking of the skin. Is it enough? Only the person concerned can know. The choice of having a dog pointing towards the hypoallergenic breeds is clearly personal and to be done on the basis of their own experiences and reactions. When the allergy is due to allergens present in the saliva of the dog the matter is complicated. The accommodation and availability of spaces can affect the final decision. Having a garden and the possibility to extensive spaces to the permanence of our dog can reduce the contact to make the coexistence between the person and the dog completely normal or acceptable. 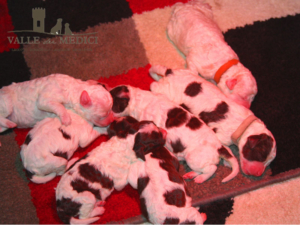 The pedigree in these situations is as much as ever recommended since we are looking for a morphological aspect typical of the breed. The dog needs the relationship with human and in particular with the people of the family who adopts him. It becomes difficult to encourage and in the same time discourage people with allergies to the dog to welcome one. On one side the reactions of allergic people are subjective. 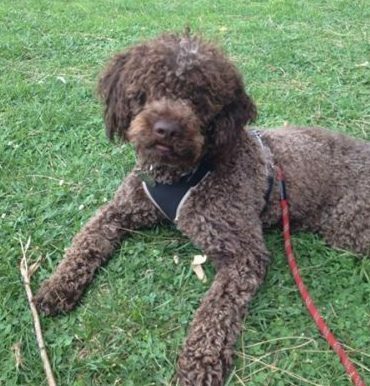 On the other side, our lagotto will need a lot of attention and pampering, as a puppy but also as an adult. A thorough assessment should be made on this point. The family and the people who live the house will have to ensure the conditions to give the dog the behavioral serenity and the freedom he needs.